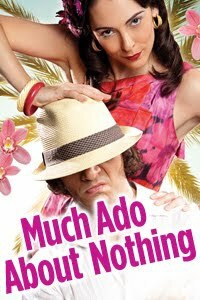 As some of you may already know from numerous online media sources, there was a controversy recently with the just-shuttered production of Much Ado About Nothing, presented at the Shakespeare Theatre Company (STC) in Washington, D.C. 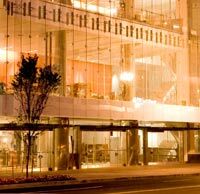 Directed by Ethan McSweeny, the regional theater production took place at the 775-seat Sidney Harman Hall, exterior shown at right, from November 25, 2011 through January 7, 2012. The play was transformed from its original setting of sixteenth century Sicily and transported to 1930s Cuba. The controversy arose when the director changed the names of two of the minor characters (Hugh Oatcake and George Seacoal in the original) to Juan Huevos (originally Juan Arroz) and José Frijoles. Peter Marks of the Washington Post referred to the change as cringeworthy and that "the joke is coarser than this 'Much Ado' deserves, and the glib cultural referencing in general comes across as a little patronizing." After hearing from many in the Latino arts community (including theater professional/blogger Marisela Treviño Orta and theater director Tlaloc Rivas), Shakespeare Theatre Company Artistic Director Michael Kahn, shown at left, agreed to change the names of the characters back to their original versions. He also wanted to have a conversation on the topics of culture, race and theater to better educate himself, his theater and his theatergoing audience. To that end, the theater had panel discussions exploring those topics. However, for HOLA, as an organization of Latino actors, the central issue involved the casting for the show. The casting breakdown never specified that the characters (who are supposed to be Cuban in this conception) are Latino/Hispanic. They were given no description other than gender; however, a later casting notice specifically referred to a character as being African American, which stood in sharp contrast to the earlier, original breakdown which lacked any specificity with regards to character ethnicity. Consequently, the show was cast with mostly non-Latinos playing Latino characters. Rebecca J. Ritzel of Washington City Paper cited, "And it seems worth noting, at the risk of sounding like a postcolonial killjoy, that there’s only one Hispanic actor in the cast, and that only the lower-class characters speak with Cuban accents. Everyone else sounds fresh off the boat from Great Britain, speaking in clear, digestible pentameter." As such, HOLA contacted the theater company and expressed our concerns with regards to casting. We received a lovely response from Alan Paul, Associate Director for the theater company. In part, it reads, "We have listened very carefully to the criticisms our productions has received, and I can assure you that the criticisms and discussions this production have brought up have increased our racial sensitivity to the Latino community." Check out this article in the Huffington Post for more info. He continues, "As you [HOLA] mention in [your] letter, we could have (and sadly did not) approach HOLA for help casting our production." As a result, the theater has reached out to HOLA to meet and audition Latino actors in our ranks in the near future for their upcoming productions. We would like to publicly commend this renowned institution for its sincere and meaningful steps it is taking to address the concerns of the Latino community in general and the Latino actor community in particular. HOLA is excited to showcase the considerable talents of our members to STC and we are confident that this will help to open much needed doors for Latino actors on the classical stage. We'd like to further echo what Marisela Treviño Orta stated in the Huffington Post article, "I think it is heartening that STC is willing to engage with the larger theatre community community and Latino community about their production choices instead of just putting up a wall of silence." Added Tlaloc Rivas, "I thought what they did was very, very, important. 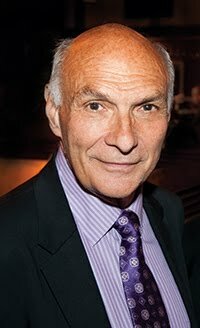 It's kind of unprecedented for a theatre company that large to actually respond."